BayGreen is dedicated to clean water, we assist boat owners and marinas with easy and convenient services to help keep the bay clean. Check out recent articles about BayGreen in Bay Crossings and the San Francisco Chronicle. Our commitment to our clients and our environment is our driving force. We currently have 4 experienced service techs on staff and 5 mobile pump-out boats stationed in key areas in the San Francisco Bay Area. This ensures speedy service for your pump service, saves gas resources, and makes BayGreen the environmental choice for the San Francisco Bay Area. As liveaboards ourselves, we know how precarious the gauges for wastewater or "black water" holding tanks are, and that awful feeling at 3am when the "full" gauge pops up or you just can't flush anymore. To help lift that sinking feeling, we've set up an online scheduling system that allows you to automatically schedule your service up to 6am the day of regular service in your marina. For those who remember after the last minute, contact us directly and we will do our best to reach your pump-out technician before he starts the run. 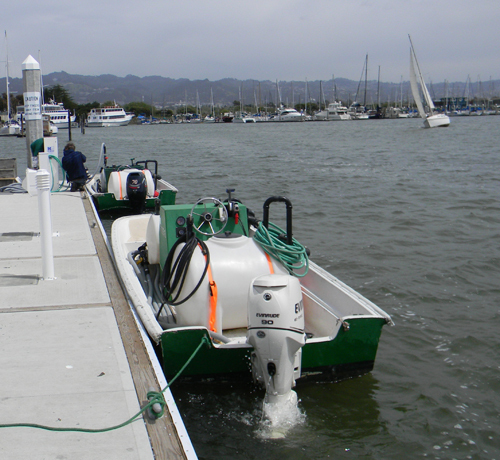 BayGreen Techs service consistently on every scheduled pump-out day unless the weather conditions in your marina (or the way getting there) may be hazardous to our techs. Those of you seasoned on the San Francisco Bay Area weather know it can be rough out there, it can be beautiful in one spot and treacherous just down the way. As we move further to our goal of stationed pump boats in every marina, we'll be able to keep our guys safe, and insure that your pump out won't need to be postponed due to nasty weather. We love to see your boat out on the Bay! It is so easy now to let us know you will be out of your slip for the day, either for fun or if you are on the hard, check out our view schedule option, you can see when you are next scheduled to be pumped and your previous pump-out services, and change your schedule if you need to adjust service. Invoices are always generated after your service, we send on-call invoices in a couple days after the service and clients on a service schedule will receive their bill consistently at the end of the service month. We now have automatic billing available. You can be automatically charged for services on the 1st, no need to do anything else! If we can be of any further help, please contact us and thanks for using BayGreen and helping to keep the Bay clean!